All organisms depend for survival on their metabolism, which is the combination of the biochemical reactions and pathways that occur in cells. This unit examines the nature of these reactions and how their efficiency is affected by environmental conditions and factors. The rate of metabolism is also partially governed by the protein hormone thyroxin. The thyroid gland, located in the neck, accumulates iodine by active transport in order to produce thyroxin, and the cells of the gland then release thyroxin into the bloodstream so it circulates throughout the body. Thyroxin attaches to receptor sites on the surfaces of body cells, where it increases the rate at which cells consume oxygen. This promotes ATP production by cellular respiration, thereby potentially increasing the rate of cell metabolism, since enzymatic activity is energy-dependent. The ability of enzymes to function is related to the precision by which they can form temporary complexes with substrates. The shapes of the molecules involved allow them to combine. Anything that affects the shapes of the molecules and therefore the formation of these complexes will affect the potential for reactions. A discussion of these conditions and factors is the main focus of the Enzymes unit. 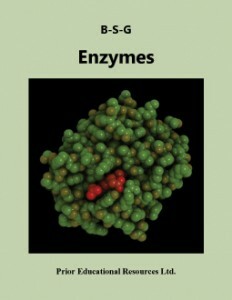 Enzymes is excerpted from our Biology 12 Study Guide, which is the sixth edition of a student study guide written to match the curriculum of British Columbia. The concepts presented are applicable to the biology curricula of other educational jurisdictions as well.